David Morales, 8, thought that he had put together a cool hat to honor American troops when his class was asked to make special hats for a meeting with another second-grade class from another school. 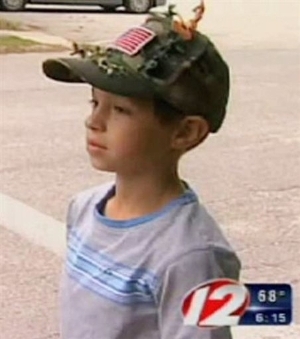 Officials at Tiogue School in Coventry, Rhode Island, however, quickly banned the hat. The reason? He placed a few small plastic soldiers on the rim and the tiny soldiers had tiny guns . . . and the school has a zero tolerance for guns. David had to wear a plain baseball cap instead on the visit with the other school. Superintendent Kenneth R. Di Pietro insists that “the issue for us was, can it be done in a way that didn’t violate the zero-tolerance for weapons? Nothing was being done to limit patriotism, creativity, other than find an alternative to a weapon.” However, the question for most of us is what can be done to have a modicum of common sense and judgment applied in such circumstances. We have been following the steady stream of ridiculous cases of school officials punishing children for everything from drawing stick figures to finger guns, here. I have written prior columns on the boys and guns as well as the zero tolerance policies at schools. I am more concerned about teaching our children to accept arbitrary and capricious authority. you make running a blog glance easy. The total glance of your website is wonderful, as smartly as the content material! Smell that, son? Reflexive jingoism in the morning. Smells like . . . brainwashing. On the other extreme, we have this great example of Gun safety. Old policy according to De Pietro (original link). New policy according to De Pietro(new link). 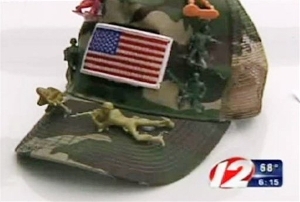 [The superintendent of a Rhode Island school district that banned a second-grader from wearing a hat with toy soldiers and tiny guns on it says he’ll work to change the policy to allow such apparel. School handbook: “T-shirts and/or jackets which display objectionable graphics or profanity will not be allowed.” Not exactly as Mr. Di Pietro claimed – and discretionary, indeed. So everyone’s arguments that the authority (Mr. Di Pietro)was being arbitrary were correct. Now, at last we are at the PROOF of those arguments. And maybe even more able to diss zero-tolerance policies in general. Now, wasn’t that fun? I enjoyed it. Pencils are indeed dangerous. Magical too. So we can see the policy is not artfully drafted, but there is still room for discretion. The first full statement of the policy provides “For the safety of all students and faculty and based on state regulations, students may not bring to school drugs or weapons of any kind. Students who display behaviors that represent danger to other student…,,” stating the policy is premised on safety and must involve behavior constituting a “danger” to other persons on the premises to be triggered. One of the specified examples of displaying “dangerous” behavior is bringing weapons to school. The following dependent clause carries the policy further stating ” regardless of the fact that a weapon may be a toy or utensil or that a drug or illegal substance may be later identified as non-threatening,…” The second clause does not, however, change the requirement that the object in question must pose, at least initially, a reasonable apprehension of danger. That the object may later be deemed harmless is apparently irrelevant. This policy is obviously aimed at “look alike” guns that could be used to intimidate students and teachers. Take my example of the sharpened #2 lead pencil (which, incidentally, G. Gordon Liddy wrote in his autobiography “Will” was, in fact, a lethal weapon), and distinguish that obviously “dangerous” utensil from the items prohibited by the policy. You can’t, of course, and the reason kids are permitted to still bring those items is that a certain discretion has been overlain this poorly written policy to prevent absurd results. Think of the even more lethal pencil sharpener which contains a sharpened metal blade (Oh, the horror). The fault lies both with the drafters of the policy; those who attempt to enforce it vagaries using no common sense; and the Board itself which apparently relied on an amateur to write a policy capable of subjecting it to so much embarrassment, and its charges to so much harm. My mistake. I understood it was the principal as well as the principle that was being criticized. I’ll have to look closer next time. Maybe Mr. Di Pietro will next OK an 8 year old girl with a Nobama T-Shirt with a “not” sign superimposed on an Obama Joker’s chest, since neither weapons nor drugs are being depicted, and redeem himself. The policy is what’s being criticized. I agree with those statements. In addition to agreeing with that sentiment, it’s been my experience that zero tolerance policies also offer great cover for people seeking an excuse to punish an individual. i’m for a zero tolerance policy on zero tolerance policies. every situation is different. I am not a gun nut; but, agree that this is ridiculous. Just wanted to share how a high school history teacher of mine would describe this kind of ridiculousness. It is the epitome of assininity.